With Final Fantasy XV’s Universe constantly expanding, a free Assassin’s Creed tie-in chapter is a very unique addition. As a tie-in to a game that is from a different series, developer and world, it’s a wonder how this Assassins Festival manages to mostly fit itself into Eos convincingly. The gameplay in this expansion expands on Noctis’ ability to warp around areas by letting him traverse areas in new ways, at least when it’s not being plagued by XV’s old downfall of invisible walls. But if you want to spend more time with XV’s still likeable cast and play some fun side quests, the Assassin’s Festival may be worth your time. The Assassin’s Festival does its best to justify its place in Final Fantasy XV’s Universe and does succeed to some extent. The event is held in the already interesting town of Lestallum and celebrates the legend of an Assassin of past that saved the town from oppression, while also honouring what happens to be Noctis’ and Prompto’s favourite game series. The festivities start off enjoyable as they should, until the Niflheim empire and an early chapter boss from the main game show up to spoil the festivities and start the assassin fun. While I’m not an expert on Assassin’s Creed, the gameplay is essentially a more stealth-based version of Final Fantasy XV’s regular style. Noctis can traverse high buildings with new climbable areas including special festival climb spots and pipes, the more dangerous and stylish looking option. Noctis’ signature warping style is incredibly useful for stealth too and together they make a mostly seamless transition into what I was used to playing in XV. On top of slyly exploring the town, it’s rare that you’ll be allowed to hack an enemy to death, as by nature the DLC expects you to stealth kill. 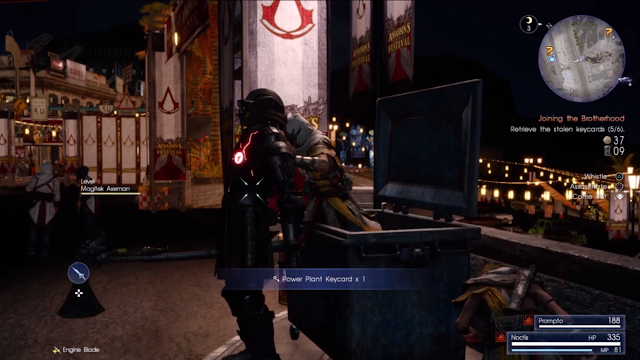 Hiding behind doors, haystacks and more hilariously garbage bins, Noctis can stealth kill enemies around town and as someone who usually runs through with pure offense, I came to enjoy running around Lestallum in this new way, luring and taking down my foes in order to get the next quest. I enjoyed these mechanics much more when they worked however, as the second half of my experience was met with a few pretty major bugs and I would highly recommend anyone who plays saves often just in case. The bugs I encountered were all in the same spot in the main quest, where I would get stuck between two invisible or real walls that would prevent me from going forward. The first I managed to trick the invisible wall into breaking by warping towards an enemy in my second try, but then I was heavily frustrated to meet another one on this run that kept me from moving forward and blocked my warp ability. The third time worked perfectly and while breaking invisible walls feels kind of cool, the frustration that came with it did dampened what were supposed to be big epic moments in a previously pretty smooth and good experience. I understand that the Assassins Festival is free, but I really hope they fix the bugs in this because I really was having fun before the last part of the experience. When there are no bugs out to play, Final Fantasy XV Assassins honestly is fun with its side quests and character banter. 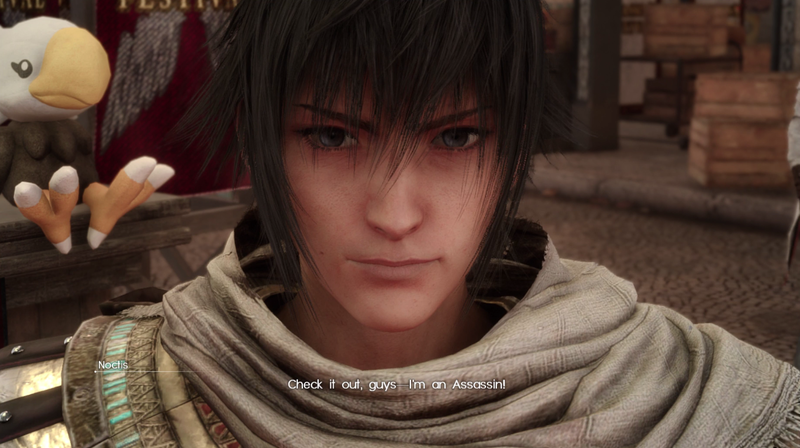 I enjoyed the quests of the Moogle Chocobo Carnival in the past, but I wished Noctis had someone to share it with and the Assassins Festival fixes this completely. 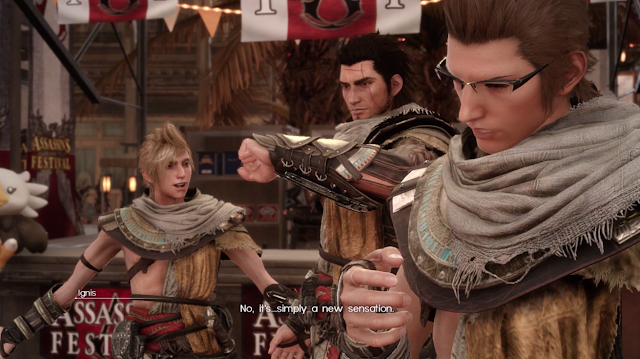 The group banter and particularly the best friend jabs that Prompto made at Noctis really made me laugh at multiple points and it’s good for anyone like me who missed seeing the whole gang together. Also if you enjoyed the Moogle Chocobo Carnival, the same style of mini-games and quests are around, with some the same such as the cactuar bopping competition and some new ones suitable for the event like a treasure hunt and finding flags. There’s plenty to keep busy with in the Assassin’s Festival and while I didn’t encounter any bugs here, the bugs I experienced in the main quest mean I will be playing with caution when I go back to them. The Assassin’s Festival has a lot of potential with its many quests and lovable party banter moments that were reasons I enjoyed the main game, but with an Assassin’s Creed twist. The twist on XV’s exploration and stealth skills was good too, it’s just a shame they’re a little buggy at the moment and need to be given off-putting precautions in what was doing so well as a good bit of free DLC for fans of the game. I had fun with the Assassin’s Festival, but I can’t call it a smooth experience just yet. For now, it’s a good idea as a fun crossover with pretty good gameplay and amusing moments with the cast of Final Fantasy XV and I hope it gets fixed up to reach its full potential someday. High potential for stealth fun, but I hope those bugs get assassinated! Did you play the Assassin's Festival? What did you think? Are you easily sucked in by free DLC like me (>.<)?